AN ATTEMPT TO PHOTOGRAPH THE SHOWY YELLOW-BILLED LOON at Brixham Harbour in Devon failed, Elvis having 'left the building'. Another product of the recent storms it presumably moved on once the sea calmed and it had fed up for a couple of weeks. 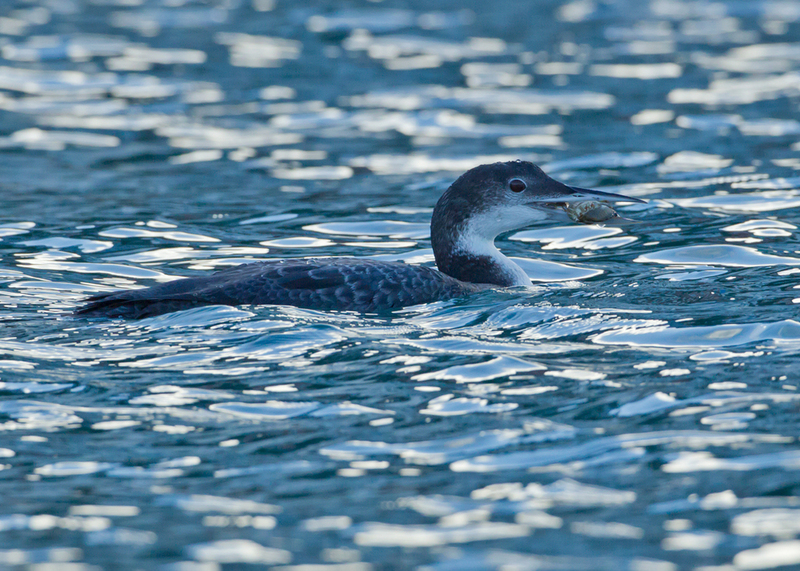 Even the Great Northern Divers were on their way out of the harbour too, with only a couple left in the marina in the evening and another two juveniles on the sea off the breakwater. There had been around 10 Great Northerns in the morning plus two Black-throated Divers, a Black Guillemot and an Iceland Gull. The previous day's estimate was double this figure. Brixham harbour has seen previous invasions, it was used by US marines in Operation Overload - the 1944 D-Day landings in World War 2. Around 20 Purple Sandpipers were resting on the old jetty near the harbour mouth, a Slavonian Grebe was off Berry Head, a couple of gannets followed fishing boats in Tor Bay and the tamest Ruddy Turnstones I have ever seen were trying to steal bait from the fishermen's boxes. Also around the harbour were a Common Raven and several Grey Seals. As the sun dipped below the hills behind the town, so did I and the long journey home began. The same bird a few minutes later against the sun - it is amazing how different they can look!